Getting there: US23 - Take US23 North from Ann Arbor (or South from Brighton). Exit and head west several miles on North Territorial. The entrance is on your left. I94 - Exit Baker Road and drive north into Dexter. Turn left into downtown (Dexter-Ann Arbor Road) and drive through town. Bear right on Dexter-Pinckney Rd. Turn right at the stop sign onto North Territorial. The park will be on your right. 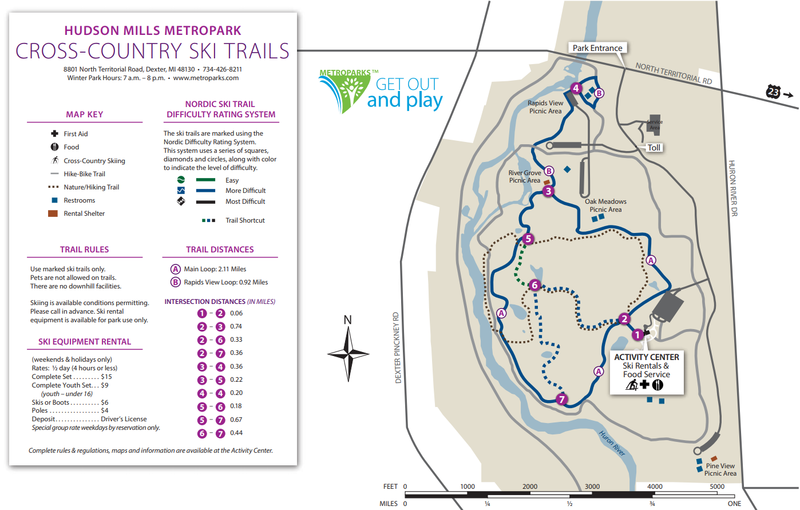 What's there: Fasten your skis and enjoy a cross-country ski excursion on six miles of groomed trails at Hudson Mills Metropark. Trails are groomed for classical skiing only. Glide past picturesque snow-glazed fields, ice-covered ponds, and beautiful deciduous forests. Take a refreshing drink from your water bottle on one of two rustic bridges overlooking the Huron River. The course has varied terrain and accommodates all skill levels. The Activity Center, features a heated lounge, food service, and public restrooms. Groups of 10 or more can make arrangements to ski during the week by calling (734) 426-8211. Dogs are NOT allowed on ski trails.